The Raiders hired offensive coordinator Greg Knapp and line coach Frank Pollack from Houston this offseason in the hopes of importing the famed zone blocking scheme to the Raiders’ O-line. That scheme, a finesse game that assigns linemen to clear an area of the field instead of sticking with just one man, has paved the way for some truly sensational runners over the years. It originated in Denver, and allowed for no-name backs like Mike Anderson and Tatum Bell to have 1,000-yard rushing seasons on the regular. In Houston, Arian Foster has become the poster boy for the system, an undrafted free agent that has become one of the most effective runners in the league behind Gary Kubiak’s (himself a Denver export) zone blocking scheme. The system is predicated on a running back that can make one cut and explode through the hole. On paper, it looked like a perfect fit for the Oakland Raiders. Darren McFadden, one of the most explosive and athletic running backs in the league, would seem to be an ideal fit for the zone blockings system. So why hasn’t it been successful yet? However, it hasn’t started popping yet. On the season, McFadden has rushed for 324 yards on a 103 carries for a measly 3.1 yards per rushing attempt. Those are pretty pedestrian numbers, but they aren’t the troubling part: it’s the caliber of opponent that he has failed to get going against that is truly disturbing. Against the lowly Jacksonville Jaguars on Sunday, McFadden only managed 53 yards on 19 carries for a putrid 2.8 yards per attempt. 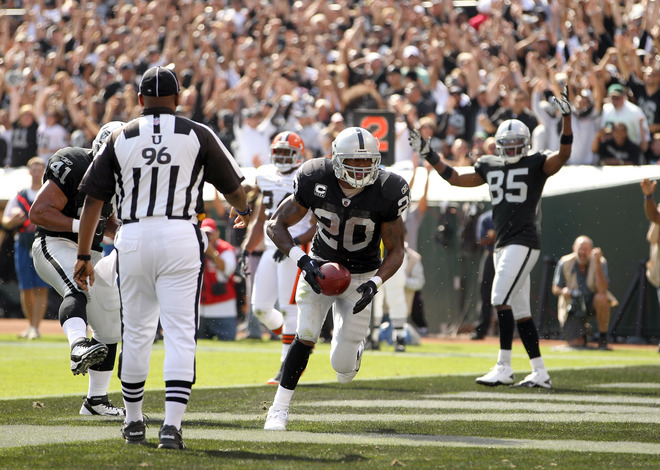 Oakland did win the game 26-23 in OT, but their offensive output left a lot to be desired. “You can’t look at those stats and say, ‘Well, O.K., we’re not going to run the ball anymore,'” Raiders quarterback Carson Palmer said last month after the Raiders loss to the Miami Dolphins, a game in which McFadden averaged two yards per rush. The zone blocking scheme has come under fire in Oakland, but its critics are missing the bigger picture. The fact of the matter is that it’s a complicated, difficult to execute scheme that can take several seasons to fully implement. Consider Gary Kubiak’s slow path to success in Houston. That team struggled through several tepid 8-8 seasons before finally breaking through last year as a power in the AFC. As much as Raiders fans want it to be the case, you can’t will a successful zone blocking scheme into existence. It takes time, patience and the right personnel to properly execute. It isn’t McFadden’s fault, nor the scheme’s fault, if it doesn’t immediately succeed. Lucas McMillan is a writer for FootballSchedule.me. 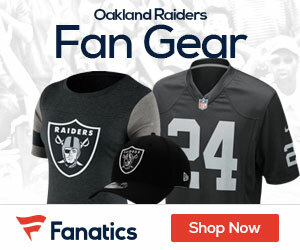 To checkout the week-by-week Raiders schedule as well as the latest NFL and college football news, visit Football Schedule. Follow Football Schedule on Facebook and Twitter @FBSchedule. C’mon Maan!! You saw what happened against the Jags. They were all over Palmer. Is it that the O-line can neither zone block nor pass protect now?! More likely, it is that defenses don’t need to worry about our run game. And if the Jaguars can bother CP3 that much, he could get hammered in KC. Really, DMc is our best offensive player and we can’t find a hole for him to run through or a way to get him the ball without 4 defenders on him!? !